The A-mode ultrasound is used to judge the depth of an organ or otherwise estimate the dimensions or an organ. A-mode scan is the simplest and oldest scanning mode. 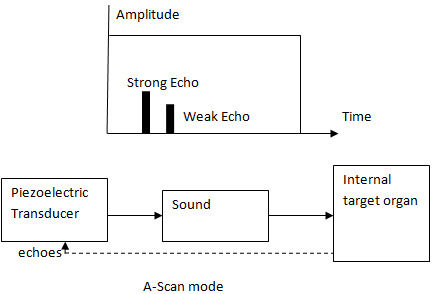 In A-scan mode a single transducer fires sound pulses into the tissue and the echoes are analyzed. The received sound impulse is processed and it appear as a vertical reflection of a point. In the display it look like spikes of different amplitudes. Strong echoes are marked with greater amplitude and weaker echoes are marked with less amplitude in an oscilloscope. Hence it is also called Amplitude (A) mode. The A-mode ultrasound could be used to identify structures normally located in the midline of brain. 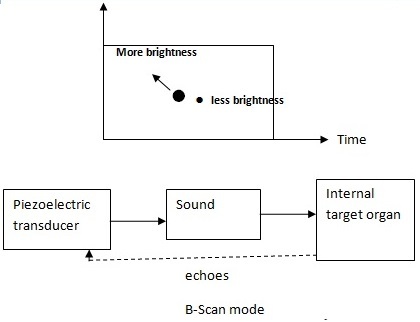 B-scan mode is called so because here the stronger echoes are marked with greater brightness. Also it is a two dimensional imaging system. Here the transducer is scanned back and forth to create a 2-dimensional view. Here sweeping a narrow ultrasound beam through the transmitting pulses and detecting echoes along closely spaced scan lines produces the B-scan images. Ultrasound beam is swept repeatedly to generate a series of individual 2D images that show motion. 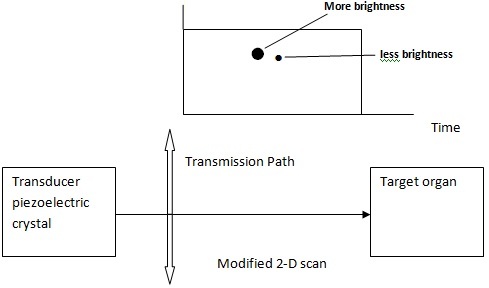 This is another modified B-scan mode called modified 2-dimensional B-scanning. Here the transducer is at fixed position and it produces pulses. These pulses are directed to concerned body organ by two-dimensional scanning scheme. We can also create a transducer array to create 2-dimensional view. Here different transducer arrays are used and each transducer can produce pulse in a particular direction. 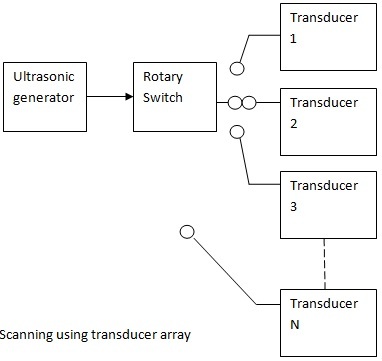 The transducer is selected by a rotary switch. Each transducer produces separate echoes and these echoes are united together to form a 2-dimensional view. Here M-mode scan means motion scan. In T-M mode scanning a sequence of B-mode scans are moved rapidly to enable to measure the range of motion. Hence it is also called Time-Motion mode (T-M). Here each instantaneous position in the scan produces depth information on one axis and time information on the other axis. Where Ø is the angle between the transmitter and the receiver, v is relative velocity.